Israel bashing ex-president announces at church's Sunday school class that MRI scan found his cancer spots are gone. 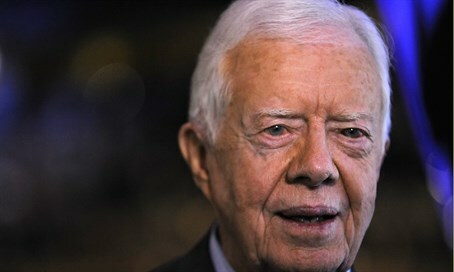 Former US President Jimmy Carter announced on Sunday that recent checks appear to show that his cancer has disappeared. "My most recent MRI brain scan did not reveal any signs of the original cancer spots nor any new ones," the 91-year-old Carter said in a statement. The ex-president first announced he had cancer back in August, when he revealed cancer was found in his liver and removed, but that it had spread to four spots on his brain. Carter first announced he was cancer free in a Sunday school class at Maranatha Baptist Church in Plains, Georgia. Jill Stucky, a member of the congregation, told the Atlanta Journal-Constitution that Carter was teaching the class of 350 people or so when he made the announcement. "He said he got a scan this week and the cancer was gone," said Stucky. "The church, everybody here, just erupted in applause." In announcing his cancer in August Carter slammed Israel, saying the two-state solution that calls on Israel to withdraw from vast regions and create a Palestinian state "is dead," and blaming Israel for that state of affairs. The former president and Nobel prize winner has long condemned Israel; in May 2014, he supported the Palestine Liberation Organization's (PLO) unilateral push to join international organizations in breach of the ongoing peace talks with Israel and the 1994 Oslo Accords. The year before, he called on the European Union (EU) to label products coming from "illegal Israeli settlements" which indeed happened last month - despite the fact that Israel's presence in Judea and Samaria is legal under international law.